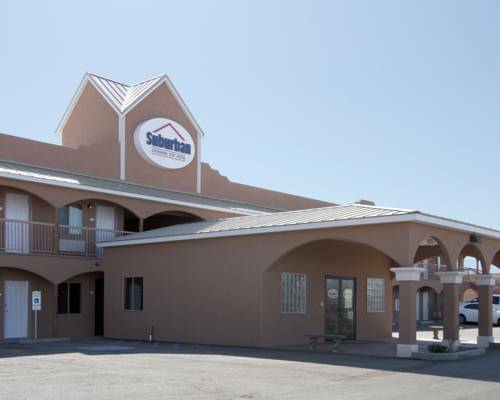 Welcome to the Suburban Extended Stay Hotel in Alamogordo, where we provide you inviting accommodations for one night, one week, one month or longer. Our hotel is conveniently located near the Gerald Champion Regional Medical Center and Holloman Air Force Base. Additional businesses and attractions close by include New Mexico State University at Alamogordo, New Mexico School of the Blind, White Sands National Monument, New Mexico Museum of Space History and White Sands Mall. The Oliver Lee Memorial State Park, Cloudcroft and White Sands Missile Range are only a short drive away. The hotel offers daily and weekly housekeeping. This is a pet-friendly hotel. Pet accommodation: 10.00USD/night. Pet limit: 1 pet per room 40 lbs or less. 25.00USD per week Non-Refundable Cleaning Fee.